^ What do browsers do instead? They rewrite all requests for http assets to https. ^ All major browsers ship with a list of domains that should never be accessed over plaintext. ^ It might take you a year to get to "preload". That is fine. CSP - nonces A nonce can be used to whitelist inline scripts which contain no dynamic content. A single nonce can be used for all static inline scripts. ^ Important: The scripts whitelisted this way can be of any content, so make sure you're not outputting any user input there. ^ Crudest and simplest way to generate the necessary hashes is to let the browser yell at you (through the developer console) that you’re missing that specific hash. View The other side of webapp security on Notist. 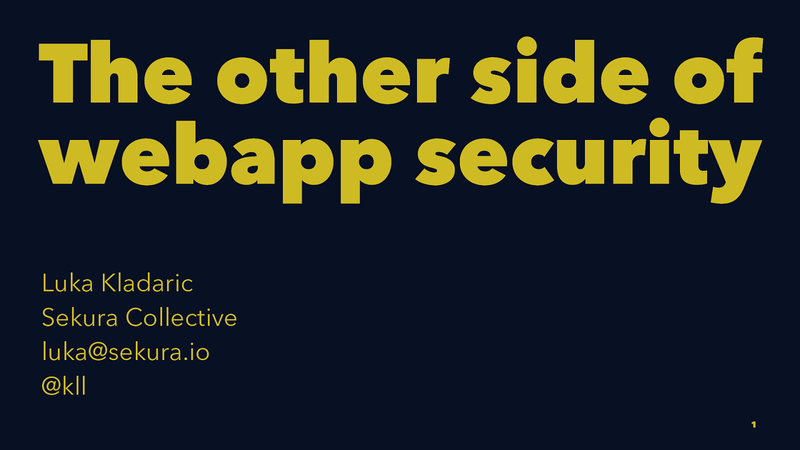 Protecting your backend and database is fine, but what about the users? How do we protect them, their browsers and computers? There's a lot of focus on backend security, best practices, how to store passwords, how to do password recovery, encryption at rest, etc. But to exploit any of those someone needs to target a website specifically, and put a lot of effort into it. But the users of those websites are exposed every day, and they access them through various insecure networks, including hotel and coffee shop wifi. In this talk we will cover the usual suspects: HTTPS and certificates, but also talk about some newer tech like HSTS and CSP.